Todd Rigby is a partner in the Phoenix office of Lewis Brisbois and a member of the General Liability Practice. With more than 25 years of tort and commercial litigation experience, Todd Rigby has litigated hundreds of complex cases, including wrongful death and catastrophic injury matters. He is admitted to practice in Arizona state and federal courts, as well as the United States Court of Appeals, Ninth Circuit. In addition to his transportation practice, Todd handles high profile product liability and hospitality liability cases for national corporations. Todd served as lead counsel in numerous jury trials, obtaining defense verdicts in cases ranging from premises liability matters to commercial vehicle negligence claims. 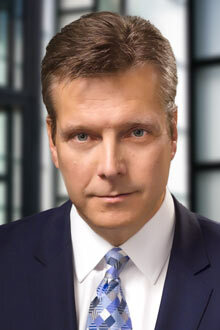 Most notably, Mr. Rigby won summary judgment on behalf of a top international computer manufacturer, resulting in the complete dismissal with prejudice of a multi-million dollar product liability lawsuit and entitling the client to recoup significant defense costs in the process. Beyond his trial work, Todd also represents clients at the appellate court level and has been admitted to various tribal courts throughout Arizona. Most recently, Todd was admitted to the Navajo Nation Bar and is representing clients in NN Tribal Courts throughout Arizona, New Mexico and Utah. Todd earned the rating of AV Preeminent by Martindale Hubbell, the highest possible attorney rating for both ethical standards and legal ability. This rating represents the pinnacle of professional excellence. It is achieved only after an attorney has been reviewed and recommended by his peers, including members of the bar and the judiciary.